The dream of a holiday paradise perfectly fulfilled. Exceptionally fine beaches surrounded by the warm blue waters of Andaman Sea make Phuket one of the world's most beautiful tropical islands. You will discover miles of white sandy beach at Bangtao Bay, here, it's also away your lazy day resting, sunbathing and unwinding in an environment of peace and tranquility. Here, at Bangtao Beach Chalet, comprising of only 10 private boutique lovely chalets, located on the quiet western end of Bangtao Beach, about 100 meters away from the beachside, not far from the executive as Amanburi, The Chedi or Banyan Tree. An easy blend of use local wealth of art and modern sophistication make this beach resort is your perfect choice for a relaxing beach holiday. - Maximum of 2 adults is allowed to stay in each chalet and one extra bed is able to arrange for third person with additional charge. - There is no charge for children fewer than 12 years, to share the existing bedding in the same chalet with their parents. - An available baby cot is free of charge. - Check out time 12:00 noon. Late check-out will be charged 50% of the rate before 6 pm and full rate after 6 pm. - Mini van (max. 9 pax) charges 300 Baht for adult and 150 Baht for child 4-12 years old per person. - From 20 Dec to 10 Jan (Peak season) : Full booking duration charges. 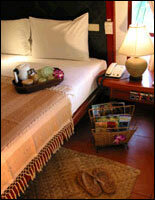 - From 11 Jan to 30 Apr and 1 Nov to 19 Dec (High season) : 2 nights. 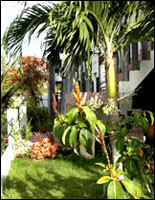 - Payment is made at your time of check out by cash preferring. - Credit card (Visa, Master, JCB) accepted. Remark : Clients will be responsible for any deductions of 4% bank processing fee. - Peak season : 30 days notice prior to arrival date. - High season : 14 days notice prior to arrival date. - Low season : 7 days notice prior to arrival date. Remark : No Show and any cases of reducing day-stay deposit are non-refundable. Only 10 private chalets in this tropical paradise resort, accommodations here, non-rising, not many, a small projects but a luxurious & stylish one in up market. 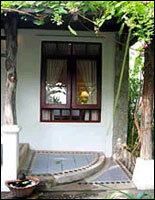 Nestled in a secluded lovely chalet, shaded by coconut palms and natural greenery, opened to fresh air, mingled with sweet smelling of several lovely flowers, Bangtao Beach Chalet is designed to be in total elegant harmony both inside & outside room with the nature while affording every comfort and convenience. Each chalet has an extra bench at its own private balcony decorated by species of charming orchid hanged around, viewing of mountain scenery as the famed Bali surroundings. 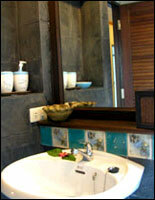 Our design is totally elegant fusion of modern sophistication and traditional Thai decoration. Every detail has been attended to, from the crisp cotton sheets and fully stocked mini-bar, to the fresh flowers decorated in your chalet stay in order to fulfill your beautiful nights sleep. Another our sister accommodation is intently designed both architectural decoration in traditional Thai style and delightful facilities in modernization to pamper to your privacy and comfort of a family staying altogether. It is located one kilometer away from our hidden little paradise resort - Bangtao Beach Chalet and pearly white shoreline of Bangtao Bay. Each bedroom has been fixed its own restroom. Particularly the master bedroom is designed to overlook the placid romantic view of the lake and to sight end of idyllic tropical mountain range. On the balcony offering of sunbathing chairs for your sun-tanned skin can be baked at home. The remain of another twin bedroom is upstairs next to living room and the last third double bedroom is downstairs connecting to pantry area which the cooking utensils available for your own cuisine can be done. A number of holiday amenities including satellite TV, radio or DVD Player are arranged in a villa to ensure your family relaxing time here will be an unforgettable remembrance. Offering “Authentic Halal Food” both in Thai and International cuisine, all will be suited to your favor and served to you by our efficient local friendly Thai staff. 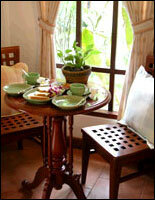 Simply the most delicious Thai food serves here, the guests who had experienced in various restaurants said to us. Our sanctuary - a secluded and opened air Thai Sala offering different treatments is the perfect place to enjoy a massage at the end of the day. 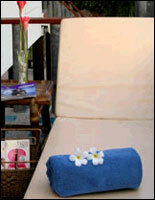 At chalet gallery, enjoy its range of sensuous massage oils, essential oils, incense and hand-poured candles. Perhaps you will find something perfect items such as beautiful gifts, home decor and functional objects at here, which reflected their own sense of art & culture.